Both perform ever worse as application gets bigger. So the abstraction leaks, we must drop underneath it and hand-code optimizations. What can we batch to save round trips? Or introduce object caches to skip round trips entirely. Now we are a distributed system, so we need a programmer to hand-tune where we are in the CAP spectrum. How fast do the reads need to be? How much inconsistency can we tolerate? These decisions become essential to the functioning of the system, and manifest in both server code coordinating with database, and UI code coordinating with server. 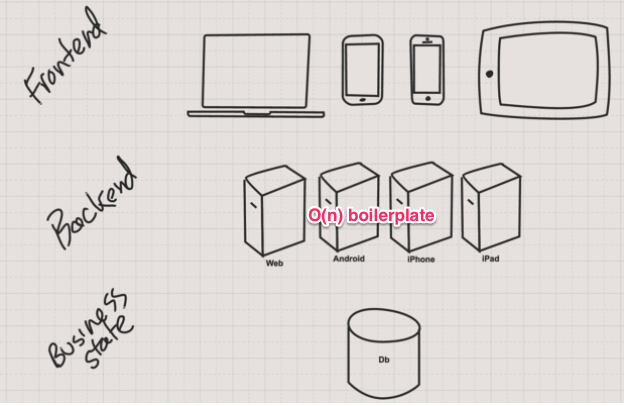 This is the backend-for-frontend pattern, is O(n) growth of boilerplate that is resistant to abstraction. I think these intractable scaling problems are the deep reason that people hate ORMs. Mongo's thesis is, we can do references in the db, and scale them, if we store trees instead of graphs. So for small apps, the boilerplate vanishes. But for non-toy apps, constraining state to be shaped like trees turns out to be hugely limiting. So back to SQL ORMs we go. Datomic's thesis is, we can do references as proper graphs, and query them, and do ACID, and not lose anything critical as compared with sql.